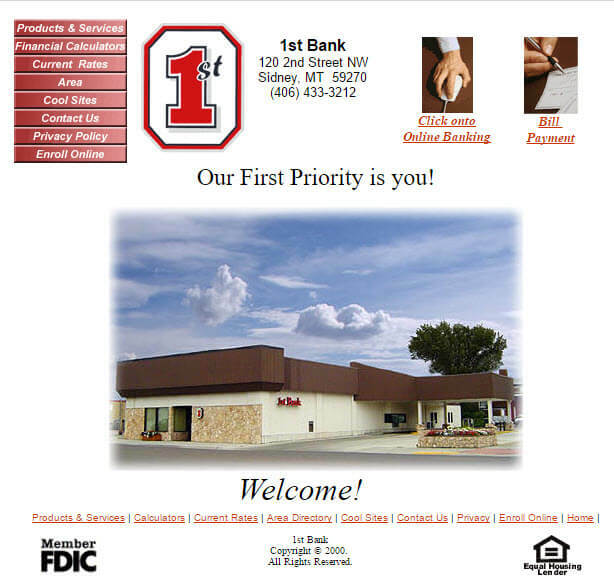 1st Bank (Sidney, MT) used to provide banking services and products. The company used to be named 1st United Bank of Sidney but they have changed their name to 1st Bank in June 1998. The company was originally founded in 1975. The company is based in Broadus, Montana. 1st Bank (Sidney, MT) used to be a subsidiary of 1st United Bancorporation, Inc.
1st Bank offers a full line of credit for farmers and ranchers. You can finance your operation, livestock and equipment purchases and even that farm or ranch you’ve dreamed of. Check out our rates and terms. 1st Bank can meet the financing needs of your business whether it be large or small. Check out our rates and terms. 1st Bank offers a variety of rates and terms for the purchase, construction, or refinancing of your home. Conventional or government guaranteed loans are available. Call or stop in for the details. 1st Bank offers reasonable rates and terms to finance that new or used car. Other personal loans are available. Check our rates and terms. Restrictions may apply. Fees could reduce earnings on the account. Early withdrawal penalties may apply. Free to all 1st Bank customers. ATM available at SPF/Exxon 24 hours a day, 7 days a week. ATM allows cash withdrawals, transfers and account inquiries. Electronically linked to other ATM locations worldwide through CIRRUS, PLUS, and Cash Card Network. No charge for using 1st Bank ATM at SPF/Exxon, 1st Bank will charge $1 per withdrawal for the use of any other ATM. This fee is in addition to any fees charged by that ATM owner. Debits your checking account automatically. Your Visa check card is welcome everywhere that accepts Visa debit cards. All services of Cash Card.